The expertly named “Music at DSU” club on campus hosted an introductory event for current and potential participants on Monday, Aug 28. 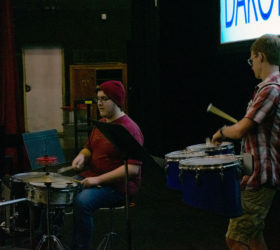 Over forty new and returning DSU students gathered at the Dakota Prairie Playhouse for a chill evening of getting to know one another over dinner, karaoke, a jam session, and sing-along songs. Music at DSU is the main music scene on campus; it contains the DSU Concert Choir and DSU Voices, and TroGin and Tonic Big Band (see what they did there?). 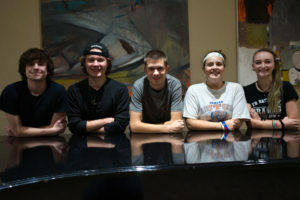 They are active in various ways around campus, from choir concerts and jazz band performances, to playing for graduation and casual “Music at Noon” events of music and singing in the TC marketplace during lunch. Trace Beethe, president of the Music at DSU club, is straightforward about the purpose of the club. “We are here for fun, this isn’t for credit…it’s very laid back,” he explains. The chill nature of the club was made apparent in the event’s activities that followed. Sandy Champion, the DSU faculty member that runs all the DSU music offerings and teaches classes at DSU, set the mood for the rest of the night by stepping up on the karaoke stage for a peppy performance of “I’m a Lady” by Meghan Trainor. New and returning DSU music participants followed with a mix of upbeat and in-the-feels tunes, from Eminem’s “Lose Yourself” to Dear Evan Hansen’s “You Will Be Found”. Following karaoke, event attendees were encouraged to grab a band instrument for an impromptu jam session. The DPP theatre filled with the harmony of old and new DSU students embracing their passion for bebop. Jaclynn Rogers, a third-year student who just transferred to DSU, hopped in on the good time. She noted, “[The launch event] was a lot of fun. A lot more people showed up than I was expecting, which was very good. I like that there’s a lot of variety going on too!” She plans to participate in Music at DSU this year, specifically in the Big Band. Attendees slowly dispersed as the event ended with some original songs, ensemble pieces, and a sing-along of John Denver’s “Take Me Home, Country Roads”. 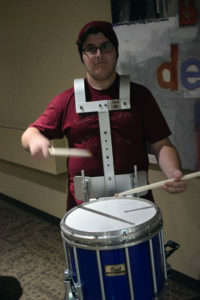 Music at DSU’s launch party served its purpose well: to give DSU students a taste of a place at DSU where they can pursue their musical interests and talents with like-minded, lively individuals in a low-pressure environment.